16th Dec 2011: Edinburgh Evening News article on Xiapex injections. 07th Dec 2011: Brighton Argus article on Xiapex injections. 05-11-2011: The International Dupuytren Society recently awarded Olly Donaldson with its 2011 award for the paper : O.W. Donaldson et al, “The association between intraoperative correction of Dupuytren’s disease and residual postoperative contracture”, published in J Hand Surg Eur Vol 2010 35: 220. 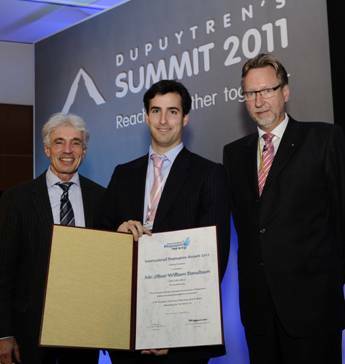 The photo below shows Olly center receiving the award from Professor Heinrich Seegenschmiedt (left) and Dr. Bert Reichert (right) at the Dupuytren’s Summit in London on 5 Nov 2011. I am an orthopaedic registrar at present working in Morriston Hospital in Swansea. I performed the research while working at the Bristol Royal Infirmary under Mr Raj Bhatia, the consultant hand surgeon working there. The aim of the study was to correlate the degree of preoperative deformity, the amount of intra-operative correction achieved and the early (3/12) post-operative results. The paper showed that those with a severe deformity faired less well than those with a lesser deformity (fairly obvious!). It also showed that those with a severe deformity who were fully corrected at surgery were more likely to lose some of that correction than a similar patient who was not fully corrected at surgery. From the surgeon’s point of view this allows them to counsel their patients better – e.g. Mr Jones we were unable to fully correct the deformity that you had to your finger but it is unlikely that this will worsen from what you have now. Cf Mr Jones we were able to fully correct your severe deformity at surgery but there is an increased chance you will lose some of that correction. One interpretation of the study is that it doesn’t necessarily pay to be too aggressive with surgery to attain full correction as you are likely to lose some of it within the first 3/12. On November 2nd two hundred people created a giant hand in Covent Garden to highlight Dupuytren’s disease, a progressive and debilitating hand condition. This marked the launch of a public awareness campaign It is in your hands. 02nd Nov 2011: It’s in Your Hands campaign. 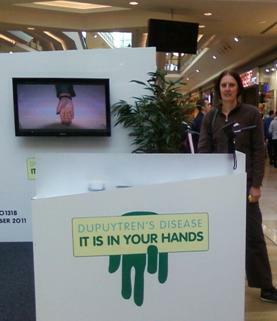 A member of the British Dupuytren’s Society visiting the It is on your hands stand in Birmingham. 24th June 2011 the decision to from a British Dupuytren’s Society was published on the facebook page of the International Dupuytren’s Society.